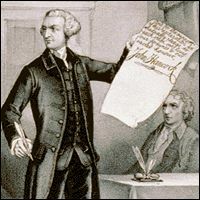 In the 1840s an item headed “Revolutionary Anecdotes” circulated in American newspapers, recounting two stories about the signing of the Declaration of Independence. This was a common type of newspaper article, material that was of public interest but didn’t become dated. Editors copied texts from other papers whenever they needed to fill space, occasionally with credit but usually without. Items circulated so thoroughly that a newspaper could run the same item a year or two later with no suggestion that readers might have seen it before. The earliest newspaper I’ve seen offering “Revolutionary Anecdotes” was the 2 Aug 1841 Adams Sentinel of Gettysburg, Pennsylvania. I don’t want to derogate the town of Gettysburg, but it’s hard to believe that was the very first newspaper to run that item. The anecdotes seem to have Massachusetts roots. Bigger databases and further research might reveal a prior publication, perhaps the original. 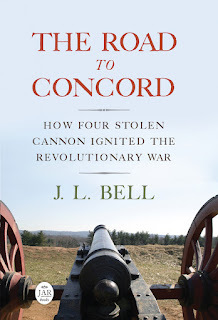 This is the earliest statement I’ve found that the British government had offered a £500 reward to capture Hancock by the summer of 1776, as I discussed yesterday. Since the item suggested that fact should already be common knowledge, there were probably earlier reports, but there’s still no contemporaneous evidence to confirm that belief. “Revolutionary Anecdotes” is also the earliest version I’ve found of the story Hancock signing his name on the Declaration so large that someone “can read my name without spectacles.” Here that figure is John Bull, the personification of England. Later authors changed that to George III or his ministers. Likewise, the wording of Hancock’s exclamation changes from one recounting to another. This Revolutionary anecdote appears more than sixty years after the event with no stated source and attached to the dubious information about the reward. As the Course of Human Events blog recently pointed out, the Continental Congress didn’t send the parchment with all the signatures to Britain but kept it in its archives. So this anecdote isn’t convincing. But it’s lasting—some authors are still repeating the story today. TOMORROW: I said there were two anecdotes, didn’t I? I tweeted this, thanks for the interesting article!